Here in the UK we’re having an early October heatwave with temperatures up around 90°C. 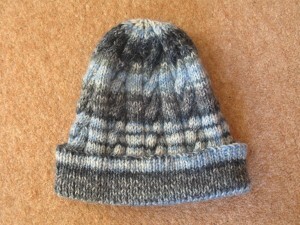 And I’ve just finished this hat ready for winter! The pattern is a repeating group of 5 plain stitches and a simple 8 stitch cable separated by pairs of purl stitches. My next project will be the gloves to go with it. The gloves have cables on the back of the hand over 4 stitches. I really like the way it’s knitted up with the multi-colour yarn. And it’s 20% wool so it’s really warm. I’m thinking of getting some more and making a winter sweater for the cold days that are bound to be coming.